A historic water tower in Antwerp received a major redo when it was transformed from a utilitarian city owned property into a modern and glowing 6-story apartment building. The tower's renovation was designed and led by Jo Crepain, an award winning Belgian architect who unfortunately died in 2008 from cancer. The water tower apartment, called Woning Moereels, stands as a legacy of his work revealing that simplicity in design can sometimes lead to the most elegant of solutions. The water tower stood empty for many years before the city decided to sell it. A local landscape architect jumped at the chance to make it into his dream home. Working with Jo Crepain, the two created a simple plan to create a 6-story apartment with a winter garden set below the old concrete water tower. The home is set on six meter high living space with a 4-story tower enclosed with translucent glass panels. Views from the home overlook the adjacent Braaschaat forest and a steep staircase leads up to each floor. Fluorescent lighting facing the street gives the tower a glowing appearance at night as thought it were a lighthouse for the town. The glass walls encourage plenty of natural daylighting, but are not transparent enough for passersby to see what is going on inside. 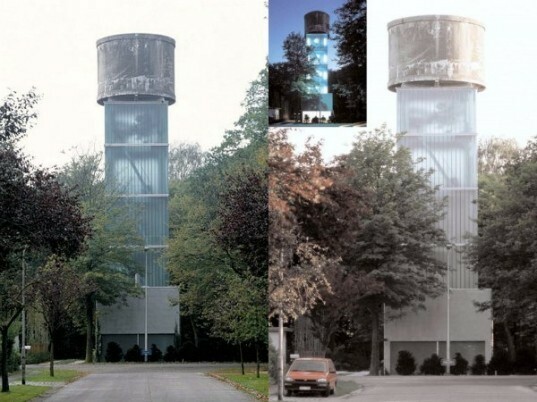 The old concrete tower and the new glass facade “reinforces the ambition of an industrial symbiosis between old and new.” Woning Moereels is an intriguing adaptive reuse project that enhances the original industrial qualities of the water tower while creating a new and useful space. The water tower stood empty for many years before the city decided to sell it. A local landscape architect jumped at the chance to make it into his dream home. Working with Jo Crepain, the two created a simple plan to create a 6-story apartment with a winter garden set below the old concrete water tower. The home is set on 6 meter high living space with a 4-story tower enclosed with translucent glass panels. Views from the home overlook the adjacent Braaschaat forest and a steep staircase leads up to each floor. Fluorescent lighting facing the street gives the tower a glowing appearance at night as thought it were a lighthouse for the town. The glass walls encourage plenty of natural daylighting, but are not transparent enough for passersby to see what is going on inside. The old concrete tower and the new glass facade "reinforces the ambition of an industrial symbiosis between old and new." 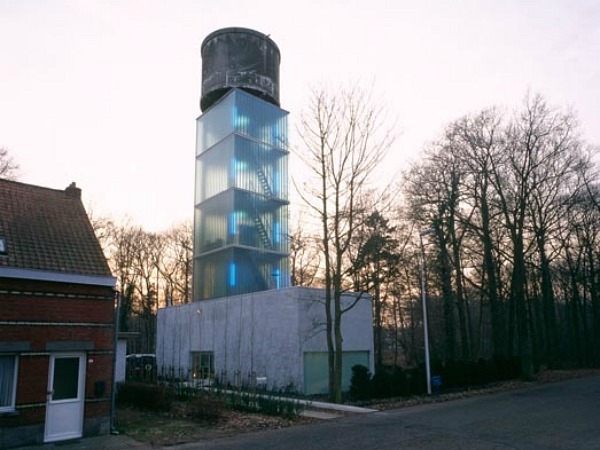 Woning Moereels is an intriguing adaptive reuse project that enhances the original industrial qualities of the water tower while creating a new and useful space. Crepain and his client had to work on a small budget to make the project work and as the architect said back in 2008, "We were lucky we didn't have the money, because what we have now is a simple, sober, beautiful building." "Sometimes it's hard to do something simple, harder than doing something complicated. We have to keep in mind Ludwig Mies van der Rohe and his "less is more", and work hard to do less." Six levels in total make up the home. Floor plans of the home and a picture showing what the tower originally looked like. Cross section of the 6 story tower.